ฺBasketball is a competition for possession of the flow of the game for the duration of 40 (or 48) minutes. A good team must know how to grind it out in search for that game changing moment. The important thing though is to seize it when the moment occurs in front of you. This game is considered the weekly Big Match if we are going by the season previews which predicted these two to finish among the Top 3 of the Basketball Thailand Super League. Hi-Tech had a record of 1 win and one close loss to reigning Thailand Basketball League and Thailand Division One champions, Nakhon Pathom Madgoats. The Mono Vampires are undefeated with wins over tournament minnows, Thew Phai Ngarm and PEA. This game would be the decisive game for the team to take the bragging rights as table leader for the entire week. The situation for the Mono Vampires was quite a bit interesting as they had recently lost star lead guard, “Bas” Kannut Samerjai, to a broken wrist during practice. Who still seems healthy sans the broken wrist, showing off an impressive kick here. However, in theory, the Vampires still have plenty of arsenal to withstand this loss in stock. Hi-Tech had no injuries to be concerned of. The only concern Coach Jerry Ruiz seemed to have was who should play and to play him, a dilemma any coach would love to have. The team didn’t give an inch to each other during the first two quarters, with both quarters ending at no more than 2 point difference. Hi-Tech came out to a fast start, with “Reuben” Wuttipong Dasom leading the fastbreak. Through he didn’t always finish on the break, but his attempt left the offensive rebounds wide open for his team mates. The Vampires answered back with their own secret weapon: Anthony McClain’s Three Point Range! For anyone who is wondering, for all major FIBA sponsered tournaments, as per RealGM, McClain has attempted only 4 three point shots since 2007 (I’m not sure about the numbers since he started his career in Thailand). In this game, the Dreadlocked Destroyer attempted a long range three from the top of the key…and made it! At that point, Coach Jerry Ruiz was probably a bit shocked. In the next play, McClain launched another long bomb. This time resulting in a dud that did even seem close. Before the game ended, McClain let loose another 3 point shot, clanging on the rim once again. If you’ve been keeping track, this game McClain attempted almost as many threes as he had during the entire past 67 years in official competition!!! But once the third quarter came around, Hi-Tech flipped it up a notch, intensified the defensive pressure, and switched gears on offense. In the third quarter alone, Hi-Tech scored 24 points as opposed to the 6 points they allowed Mono to score. The limitation to six points was more credit to the Hi-Tech defense than a slight on the Vampire’s offense. One of the more visible disruptions to the normally fluid offense of the Vampires was the bulldoggish hustle “Son” Kannawat Lertlaokul played on “So” Sorot Sunthonsiri. Once the Hi-Techdefense fell into place, it started forcing turnovers from the Vampires, which played nicely into the hands of Reuben, who mysteriously was absent from the second quarter despite a very good first quarter. Both Reuben and “Dave” Sukdavb Ghogar are players who are more effective when they have a lot of space to work with. Running the Fastbreak and Trailer Break efficiently maximizes the offensive capacity of these two players and they certainly showed that in this game. The dynamic duo were the Hi-Tech offensive spearheads on offense, which was highlighted by a breakaway jam by Dasom which entertained the dunker himself quite a bit. 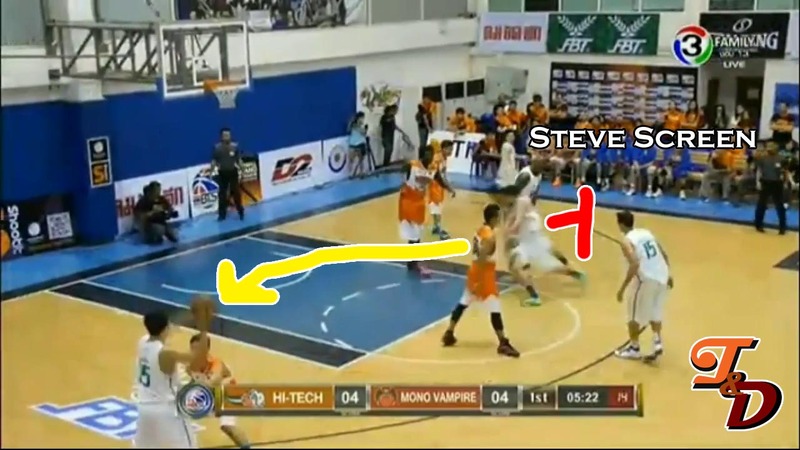 Once they entered the 4th quarter, the Vampires tried to fuel a comeback with a Fullcourt press which Hi-Tech seems like they weren’t ready to handle. However, the lead had buldged to too much. The Vampires has a really bad shooting day, but none more than “Chopper” Jitraphon Tohweroj. The final score would be 77-58 in a game of 3 well fought battles and one poorly fought. 1. The Offensive Evolution of Reuben: Reuben is marvelous in transition with his aggressive approach towards the hoop and that’s how it’s always been. During the ABL season though, you could see that Reuben had started to add a mid-range and long range game into his bag of tricks. In this game, we got to saw more of his post game. Other than a pretty good spin move, Reuben has a nifty little Counter Spin Move in case the defender doesn’t commit to the spin. At this point, if Reuben can find a way to create shots off the dribble, that would push him closer towards the “Best of Thailand” Title. 2. But Sorot says “Wait a second…”: If we’re going to have a conversation about the best players in the country, there’s not a lot of players who’s been on a hot streak as that of Sorot Sunthonsiri. After being crowned MVP of the TBL, he’s had to shoulder a lot more responsibility once “Bas” Kanut Samerjai fell with an injury. 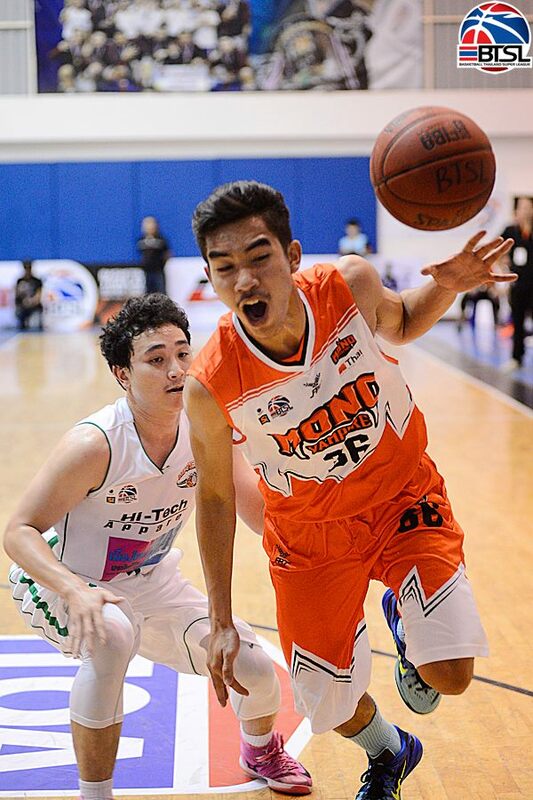 Without Kanut to help support with the scoring load and ballhandling duties, Sorot has blossomed even more, as emphasised by this crossover on Nakorn Jaisanook that left the Hi-Tech sharpshooter dazed. That move certainly got the approval of veteran “Singha” Chanachol Klahan who couldn’t keep in his excitement. 3. 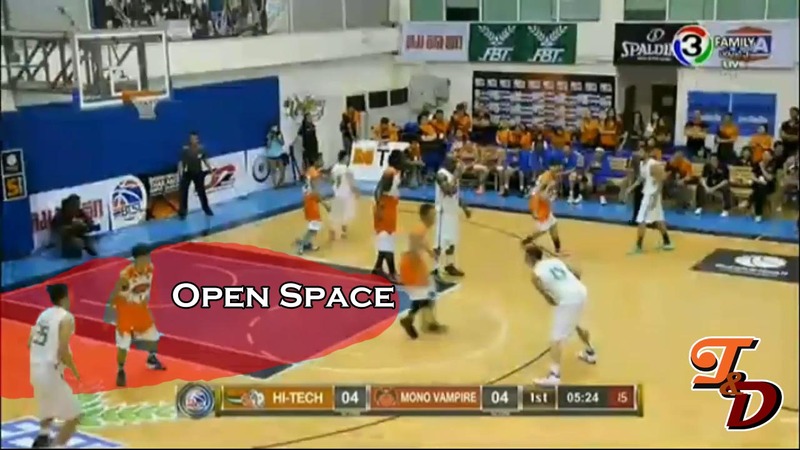 Offensive Identity: Mono Vampires Coach, “Seng” Prasert Siripojanakul, runs an offensive scheme this is quite flexible for the players on the court to express their creativity, which the players have plenty of. But the offense of Coach Jerry Ruiz is more focused on spacing, as in terms of creating space for players to move into continuously until they are able to get a good shot. I was quite impressed with this following easy setup they used to get Reuben the ball in the post on the move. 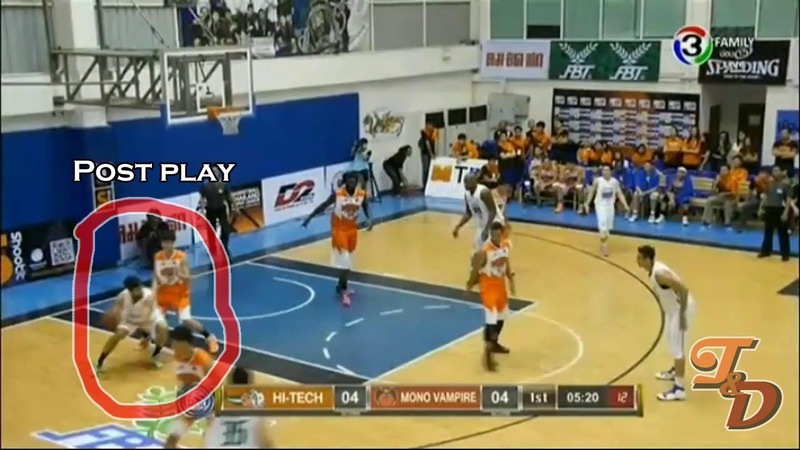 In this first instance, the Hi-Tech players flood on the right side of the court. Kannawat buries himself in the right corner. Reuben, the main target is placed on the right wing. Steve Thomas is on the right high post. Sukdavb initiates the offense from the top of the key. This leaves an open space on the low post on the left, which is where Hi-Tech wants the action to be in. Steve Thomas screens Reuben up at the wing. If he gets open, easy layup. If Mono switches, Steve Thomas gets the mismatch. However, the Mono defender is able to catch up to Reuben but Reuben already has spacing to get the ball in the post while McClain is dragged out of the paint slightly to wards Steve Thomas. Reuben easily gets the ball in the post with a defender darting at him after the screen caused separation. Nothing fancy and pretty simple, but if well executed, quite effective. This was a game that sent out a message that Hi-Tech is a team that has the potential to ramp up the defense and run you out of the gym which can cause a blowout within a couple of minutes. On the other hand, if we ignore that horrendous 3rd quarter, we saw that Mono Vampires can hold their own against the top tier even without superstar guard, Kanut. These two teams are in the form that should be able to stay perched among the top of the table until the end of the season. But it that theory holds up or not, we will have to see for ourselves as the season progresses. Pictures by Kuk Ornvisa Thewphaingarm as always.